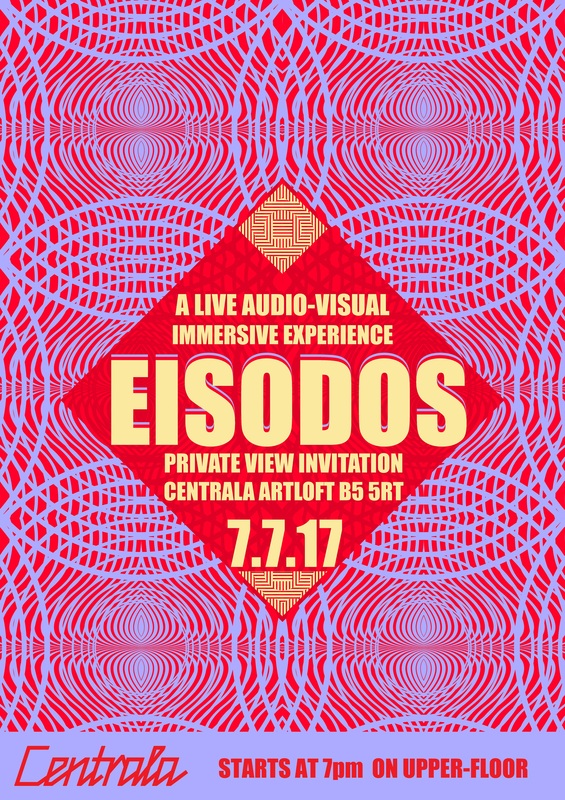 Eisodos is an immersive audiovisual experience with a live performance during the private view. The project is a collaboration between visual artist Paris-Ch ( www.paris-ch.com ), visual artist Stelios Ilchouk ( www.steliosilchouk.com ), experimental electronic duo EIF ( www.facebook.com/earthisflatmusic ), violinist and conductor Thomas Payne and mezzo-soprano Magdalena Ardelli. The post-internet era art environment includes hand pulled silk-screened wallpaper, light installation projections and atmospheric sound-scapes from the composers of the auditory aspect. They will perform live on Friday 7th of July as part of Digbeth First Friday at Centrala gallery.